Be the first to share your favorite memory, photo or story of Cromer. This memorial page is dedicated for family, friends and future generations to celebrate the life of their loved one. 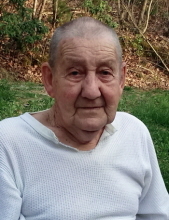 Mr. Cromer Smith, 84 of Sand Springs, passed from this life on Thursday, March 28, 2019 at Rockcastle Regional Hospital. He was born in Rockcastle County, KY on March 8, 1935 the son of Roscoe and Alice Pittman Smith. He was a farmer and a member of Bandy Church of Christ. He enjoyed watching Bro. Murray on tv, as well as fishing and hunting. He loved his Lord, his grandkids and great grandkids, and his dogs. He is survived by three sons, Cromer Smith, Jr. and wife Sabrina of Sand Springs, Jeff Smith and wife Lori of Mt. Vernon, and Porter Smith and wife Ashley of Red Hill; a daughter, Trina Coffey of Sand Springs; and a sister, Grace Pratt of Science Hill. 17 grandchildren and 19 great grandchildren also survive. He was preceded in death by four brothers, George, Emory, William, and Earl Smith; and a sister, Rebecca Singleton. To plant a tree in memory of Cromer Smith, please visit our Tribute Store. "Email Address" would like to share the life celebration of Cromer Smith. Click on the "link" to go to share a favorite memory or leave a condolence message for the family.